We are a guiding company offering Mountain Bike riding and Rock Climbing tours utilising the world class tracks and climbing areas around picturesque Tasmania. We have an extensive range of tours available in Tasmania, the home of Mountain Bike Riding with the development of world class trails including Blue Derby. Mountain Bike Tasmania can offer you unique adventure tours only found locally, our transport and hire service makes it easy for beginners and interstate visitors to still be able to experience Mountain Bike Riding in Tasmania. Rock Climbing Tasmania offer tours for School Groups, and for those that are new to the sport including introductory day trips in Launceston’s Cataract Gorge and at the Freycinet Peninsular. if you are an experienced rock climber, we have that covered too with advanced climbs on some of the more remote cliffs in Tasmania. We offer numerous mountain bike tours which take place in bushland and mountain bike trails all over Tasmania, utilising all the amazing new single trail networks that have recently been developed such as Blue Derby and Hollybank. As well as our day trips, we can also put together custom multi day itineraries for your group. Four and five day options for groups of up to sixteen are Mountain Bike Tasmania’s specialty. These trips incorporate the Launceston trails of Kate Reed and Trevallyn Reserve as well as Hollybank, Blue Derby and Mt Wellington. As part of this service we will book your accommodation and handle all your transport with our comfortable bus and purpose built mountain bike trailer. Our experienced guides will ride with you to ensure you get the most out of your time in Tasmania without the hassle of having to refer to trail maps. We are a guiding company that utilises the world class Rock Climbing areas of Tasmania to offer experiences in the vertical for a huge range of clients. From School Groups and those new to the sport on introductory day trips in Launceston’s Cataract Gorge and the Freycinet Sea Cliffs through to personalised multi-day adventures for experienced climbers on some of the more remote cliffs in the state. Let us show you some of the highlights of Tasmanian Climbing whether you are looking to climb outdoors for the first time after getting a start indoor through to custom tours for more experienced climbers. We can also put together corporate team building programs to get your team out of their comfort zone while working together in an encouraging environment with the spectacular Tasmanian scenery in the background. Tasmania is quickly becoming known as world class destination for Mountain Bike Riding. Tasmania’s natural terrain is diverse and the clean air make mountain biking a joy. Locals love riding the trails because they are accessible and there there is a some much single trail. Mountain Bike Tasmania can take you to these locations to experience some of the best trails in the world. Below are our tour highlights, click the links for more details. The ride that we are most famous for….. and justifiably so ...is mostly downhill (sorry, yes that was mostly!) so hold on and enjoy the ride. Our local guides will take you on one of the ultimate mountain bike descents possible in Tasmania with a total drop of 1050 vertical metres. Learn more. The Most recent addition to the Tasmanian trail network, the Blue Derby Mountain Bike area is set to become one of the most coveted trail areas in the country. The highlight is the fantastic scenery through stunning old growth forest coupled with magnificent trails built with amazing attention to detail. Learn more. This is one of the newer trail developments in Tasmania and is rightly receiving a lot of positive publicity. On this tour, Mountain Bike Tasmania will show you the full range of trail options. Learn more. If you only have a few hours and want to explore some of Launceston’s most popular tracks then this trip is for you. The Trevallyn Recreation Area borders our world famous Cataract Gorge and has everything from ‘cruisey’ fire trails to fun single track sections. Learn more. Currently Launceston’s most popular riding area, due to a recent upgrade by the Launceston Mountain Bike Club, Kate Reed in the north of Tasmania is the first area to see development of purpose build single trails that offers great flow with many extra features for use for those with the skills. Learn more. Take a leisurely morning to soak up some of Launceston’s waterfront atmosphere (figuratively speaking!). The majority of the circuit follows the meandering banks of Launceston’s rivers and with no major hill climbs you can take it pretty easy. Learn more. One of the best mountain bike specific trails presently on offer in the country, The North South track, on Mt Wellington near Hobart has been built to an extremely high standard, with the workmanship and attention to detail on the trail the only thing likely to distract riders on this awesome descent. Learn more. This trail is a hidden gem that is ideal as an introduction to Mountain Bike riding near Hobart. Recommended for families or those who are beginners would like, following the water pipe from Fern Tree to its origins at North West Bay River. Learn more. One of the most popular areas for Mountain Bike riding near Hobart this extensive area links in with the Clarence Mountain Bike Park. A great range of trails here are utilised to form a 25km loop. This area suits those with prior Mountain Bike riding experience who are happy to ride up as well as down. Learn more. 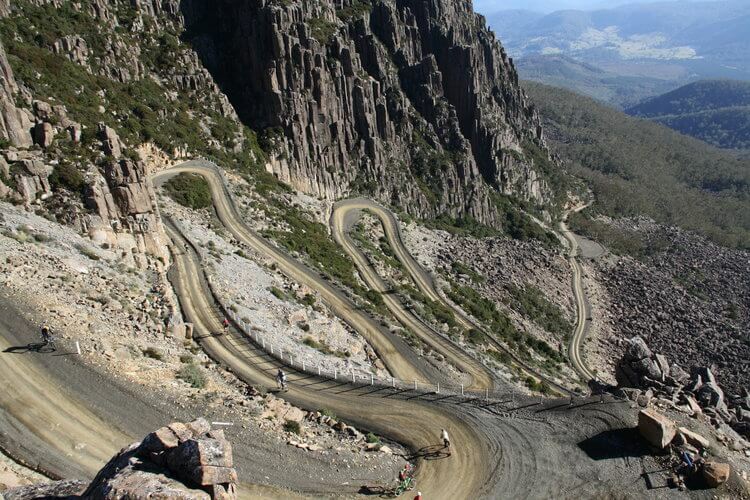 Do you want to spend more than one day riding the incredible trails of Tasmania? Mountain Bike Tasmania offer multi day tours and handle everything to make your trip hassle free. All you need to do is get off the plane! We can customise locations and daily schedules to suit you. Learn more. From School Groups and those new to the sport on introductory day trips in Launceston’s Cataract Gorge through to personalised multi-day adventures for experienced climbers on some of the more remote cliffs in the state. Located in the heart of Launceston, the Cataract Gorge is a natural gem that has been the training ground for local climbers for years. This tour begins with an introductory Abseil off a spectacular cliff, overlooking the Gorge. Learn more. This climb begins with an introductory Abseil off a shorter cliff to get the technique fine-tuned. Then move on to a spectacular 40metre drop with a free hanging section that is sure to get the heart racing. Learn more. On the spectacular East Coast, Freycinet Peninsular is home to one of the most popular rock climbing areas in Tasmania, with the cliffs plunging into the sea on the edge of the coast. Learn more. One of the iconic climbing areas of Tasmania, the Organ Pipes on Mt Wellington offers a range of predominantly multi pitch crack climbs. This area is suited to climbers with prior experience who are confident with lead belaying and abseiling. Contact us for more details. There are a number of areas near Hobart that are suitable for introductory climbing and abseiling. Popular with school groups, areas such as Rocky Tom on the eastern shore and Conningham, south of Kingston. Contact us for more details. Mountain Bike and Rock Climbing Tasmania have equipment for hire for both bushwalking and mountain bikes and mountain bike gear. Mountain Bike and Rock Climbing Tasmania also offer transport options to the start of the major Bushwalking and mountain bike riding areas in Tasmania. This can also include pickup from the end of your trip with return transport to either Launceston or Hobart, we can also store gear for you and have it at the end. Learn more.